Fine Mess Pottery: I'm baaa....aaaack! 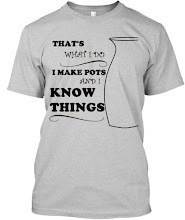 I often get ideas for mugs while I am at the IPTOG. 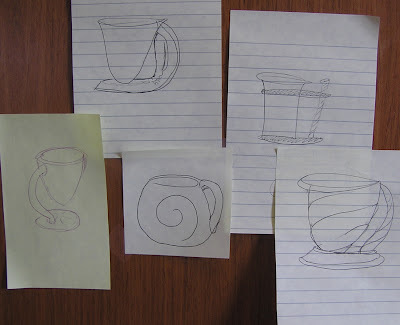 I just sketch them out on sticky notes, and slap them on the cabinet. My new old computer arrived today, and I am still tweaking it into shape. New computers are like new shoes -- you gotta break them in. I want to get this posted before Blogger's "scheduled outage," so I'll keep it short, but I have tons of things to post, from my recent firing (two new glazes and a new sig, all the bees' knees) to Etsy to building a light box. Visit again soon!